Chrichton's World: Review Fred Claus (2007): What if Santa Claus had an older brother? Review Fred Claus (2007): What if Santa Claus had an older brother? What if Santa Claus had an older brother and is tired of living in the shadow of his younger brother. One can imagine that it would be difficult for anyone to compete with such a beloved mythical figure. 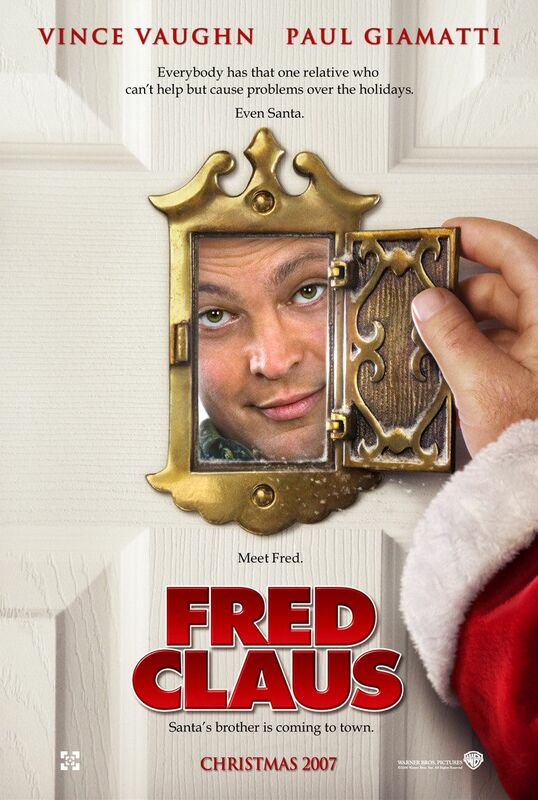 Fred Claus played by Vince Vaughn is this older brother and doesn't want anything to do with him and the festivities. But he just can't escape him. In one of his attempts to make something of himself he manages to get arrested and has to ask his brother to bail him out. Nick "Santa' Claus (Paul Giamatti) has a condition. Fred needs to work for it in his workshop on the North pole. Fred agrees and thus starts Fred's adventure and his redemption. As it turns out Nick is in trouble since an efficiency expert is out to shut Santa and Christmas down for some reason. This expert is played by Kevin Spacey who is incredibly evil in this one. Not once is it mentioned who he reports to but since he mentioned the other holidays being in trouble also it is implied that he reports to a council of higher beings. For obvious reasons it is left vague and abstract and for the overall story it doesn't really matter. All that matters is that a lot is at stake for Santa and that it is up to Fred to save the day. Fred Claus is more about family than it's about Christmas or the Christmas spirit. I thought it was a very touching and endearing story where some real issues are being addressed. What is it like for a sibling to live in the shadow of a more successful or popular brother or sister? While they easily could have gone deeper into the issue they chose for the easy way out which is understandable although it did feel like Kathy Bates was underused. She plays the mother who is very proud of Nick but neglects to display that pride towards Fred. Whenever Nick does something kind or good she asks Fred why he can't be more like Nick. Of course she means well but it's not fair since every individual has their own unique qualities and characteristics. You can't expect all your kids to be the same. It is because of her that Fred started to dislike his younger brother. Fortunately Fred realizes that his hatred for his brother is unfounded and that he needs to do whatever he can to help him. Especially because of the promise he made to be the best big brother ever. Vince Vaugh did a very good job of playing the older disgruntled brother. It is said that he often plays the same role over and over again. Perhaps that is true but somehow for this role it works for the story since he pulls off the good man with bad boy tendencies routine rather nicely. Next to being touching and endearing Fred Claus is also very funny. There are more than enough moments where you will be laughing out loud. Overall Fred Claus is an incredibly entertaining Christmas film that in my opinion is a little underrated. So do give it a shot!